The 22nd Eurasian Economic Summit has today started in Istanbul. A large Azerbaijani delegation participates in the event organized by Marmara Group Strategic and Social Research Foundation. The delegation includes the Azerbaijani President's Assistant for Public and Political Affairs Ali Hasanov, Deputy Speaker of Milli Majlis Valeh Alasgarov, Minister of Energy Parviz Shahbazov, representatives of non-governmental organizations and journalists. The summit brings together high-ranking state and government officials, former presidents, MPs, representatives of international organizations, public and political figures from nearly 40 countries. The event is being held under the slogan “Responsibility for the Future”. Addressing the opening of the summit, the Azerbaijani President's Assistant for Public and Political Affairs Ali Hasanov read out President Ilham Aliyev`s congratulatory letter to the event participants. 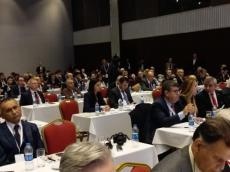 Other speakers at the event included President of Marmara Group Strategic and Social Research Foundation Akkan Suver, Minister of Energy Parviz Shahbazov, Speaker of the Grand National Assembly of Turkey Binali Yildirim and head of the Istanbul Apparel Exporters' Association Mustafa Gultepe. The two-day summit discusses a wide range of issues, including the development of technology and the future of humanity, the new dimensions of globalization. Marmara Group Strategic and Social Research Foundation has been organizing the Eurasian Economic Summit as a peace and dialogue project for 22 years.